And now about the show. In the time it takes to make an apple pie (about 75 minutes in this case), Miriam tells us her story. 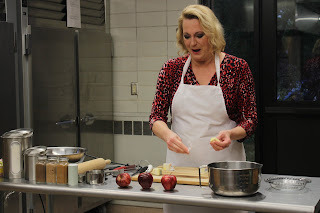 She's in the kitchen of the prison where her son is on death row for murdering two people. After 22 years of one-hour Sunday visits, the day of his execution has finally arrived. Robert's last meal request is a piece of his mom's apple pie (for the record, my mom's apple pie would also be my last meal request). They of course wouldn't allow her to make it in her own kitchen for fear of what she might put in it, but they let her make it on site with prison-supplied ingredients. Except for the apples, which Miriam searched for in grocery stores and only found sub-par ones, this being winter and not apple season. By the way, we are actually in a kitchen - a tiny kitchen in a church, and Miriam (or rather Gina Sauer) is actually making an apple pie as we watch. I have a weird fascination with watching people perform actual tasks on stage, like folding laundry or cooking, and apple pie is pretty much my favorite thing to bake (although I cheat and use frozen pie crust), so I found this super compelling. She makes the crust from scratch, cuts the apples, puts it in a working oven, sets the timer, and cleans up while waits for the pie to bake. Maybe this sounds boring, but it's a clever device by Iowa-based playwright Jennifer Fawcett to frame the story in real time and in a real and tangible slice of life (pun intended). Through the pie-making, we learn about Miriam and Robert, what a sweet little boy he was, how she nursed the apple tree in their yard until it bore abundant fruit, and their September ritual of making apple pie. Rituals can be comforting, they can be a thread back to a happier time, they can be a buoy in open water, as Miriam says. She hopes that her son finds comfort in the familiar flavors, that he feels his mother's love and presence. She finds comfort in the ritual herself, in remembering their life "before." But she also uses the ritual to say good-bye to her son, for one last final time. Miriam is not always likable throughout the play, but she is very real and human and relatable. Under director Shalee Mae Coleman, the story plays out well in 75 minutes, taking its own time, not rushing, with appropriate pauses. Just the logistics of making everything work along with the process of baking a pie from start to finish are daunting, but it's executed with precision by the Uprising team. Gina Sauer's performance is also remarkable; not only does she recite a 75-minute monologue, but she also conveys Miriam's full range of emotions, all while making a pie! It's quite a feat, and quite fun to watch. But that's really the only thing that's fun about the play; most of it is quite sobering as you look at the devastation Robert's addiction, violence, incarceration, and execution have wreaked on many people and relationships. It's really quite tragic, and puts a human face and story on the prison reform efforts and awareness of late. 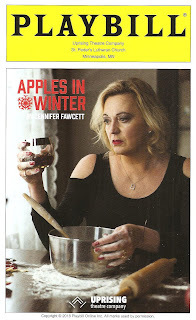 Apples in Winter officially opens tonight at St. Peder's Lutheran Church in the Hiawatha neighborhood of Minneapolis (there is a small parking lot, and plentiful free street parking), with just eight performances this weekend and next, including Saturday matinees. Click here for more information and to purchase tickets (all tickets are pay what you can, with a minimum of $5 and a suggested price of $20). If you've never seen an Uprising show before, this is a great time to check out the good work they're doing, on and off the stage.